Here's a fun bit of trivia: Your cleanser could be causing your acne. I know this because most of my "hormonal" acne mysteriously disappeared when I stopped using my "gentle, dermatologist recommended cleanser." Unfortunately, for those of us with acne-prone skin, most dermatologist know very little about OTC product formulations. There are a ton of cleansers out there and it can be confusing to navigate it all without some cleanser help. Virtually every brand carries a facial cleanser that foams. Virtually every brand markets foaming cleansers to people with acne-prone or oily skin. The Bummer: Many foaming cleansers, especially those aimed at oily/acne prone skin, contain harsh ingredients or stripping surfactants that can actually make your acne worse. Most foaming cleansers contain "sulfates," a surfactant that foams spectacularly well. Going sulfate free was my first step outside of the traditional cleanser box. I had used Dermalogica Special Cleansing Gel for years before switching to the much cheaper, and easier to find, Cetaphil. When I developed perioral dermatitis (PD), I discovered that sulfates may contribute to it, so I cut it out of everything I put on my skin (shampoo, body wash, toothpaste, and facial cleanser). In my case, simply cutting out sulfates was not enough to fix all this (that is my face), but for those with sulfate sensitivity, it can be a godsend. Most liquid cleansers don't actually contain soap. Soaps are made from saponified fats (like olive oil or coconut oil) and usually have a higher pH than facial cleansers. A lot of people like soap because they tend to contain more natural ingredients. The Bummer: Soap's higher pH and it's characteristic oil content triggers acne in some people. What do you do when every foaming cleanser you've tried gives you acne? Something that doesn't foam! Non foaming cleansers are among the gentlest cleansing options available; I believe non-foaming (aka "lotion" or "milk") cleansers can work for all skin types, even those with oily skin. The right product can provide proper balance, and you may not need to use a separate moisturizer anymore. The Bummer: If you are used to foaming cleansers, a non-foamer might make you feel like you aren't getting your face clean enough. Some non-foaming cleansers are too emollient for oily skin (the hyaluronic acid in Cerave was too much for me, for example). Cold creams conjure up images of your grandma slathering what looks like crisco all over her face (yes I'm imagining your grandma). The legendary tub-o-Ponds didn't die out in the 50s though, it just evolved into the much more posh sounding "cleansing balm." I'm including cold creams here as a distinct category from "Non Foaming Cleansers" because cold creams are thicker and more moisturizing, and tend to be better at removing makeup. Cold Creams are great for those with dry skin. The Bummer: Cold creams are often too heavy/emollient for acne prone skin. Many contain mineral oil and/or paraffin wax, both of which can be problematic for some. Recommendations: Like some non-foaming cleansers, cold creams are supposed to be applied to dry skin, massaged in, then "tissued off." You can also wipe the cleanser off with a wet washcloth, then rinse your face a few times with water. In general, I don't recommend cold cream/cleansing balm for acne prone skin. At the same time, I've had luck with products that aren't recommended for acne, so who the hell knows? Best Bets: If you have acne and oilier skin, check out the non-foaming cleansers (#4) or the oils (#6). If you have acne and drier skin, and don't have problems with mineral oil/paraffin, I've heard good things about fragrance free Albolene (ingredients: mineral oil, petrolatum, paraffin, ceresin, and beta carotene). Oil cleansers work in the same way as cold creams do: they are applied to dry skin, then wiped off. I discussed the Oil Cleansing Method (OCM) in my review of jojoba oil. OCM truly terrifies me, but a lot of people swear by it. The Bummer: Oil doesn't always mix well with acne or oily skin. Cleansing wipes are a super popular alternative to face wash: virtually every major brand has a few varieties specifically for removing makeup and dirt, and dissolving oil. I'm not convinced something branded as a cleansing wipe is really that different from a baby wipe, fyi. The Bummer: A lot of cleansing wipes contain harsh detergents that should not be left on skin. Others contain oils and fragrance that can trigger acne or irritation. Recommendations: I do not recommend makeup wipes for regular cleansing of acne prone skin because the stuff on the wipes isn't typically rinsed off. If there is anything problematic in the cleanser, the effects will be amplified if you leave it on your skin. I can, however, get behind using cleansing wipes as an eye makeup and foundation remover, followed by a normal cleansing routine. Best Bets: Lumene makes a good, inexpensive wipe (it's fragrance free and does not contain nasty ingredients). This stuff is super trendy, right? Micellar water is not the same thing as a toner because micellar water is actually meant to cleanse; these guys contain surfactants y'all. If you don't do well with foamy face wash, you might have better luck with micellar water because it is milder. The Bummer: Micellar water may not get your face as clean as you like, and because they contain surfactants, they can be problematic for certain skin. For me, the main draw to natural cleansers is the super limited ingredient situation. If a one-or-two ingredient product doesn't work, you will have a very good idea who the culprit is. The Bummer: Natural alternatives may not be the best at removing makeup, they tend to require more time and effort to use, and they can be messy to apply. Perhaps you've learned that the more stuff you put on your face, the worse your acne gets. I have discovered (as have many others) that you can get your face pretty darned clean with just a washcloth and water. This can be a good option for those who use very few products, or as a part of a semi-regular cleansing routine (cleansing with only water every-other day, for example). The Bummer: Foundation, makeup, and other products may not remove fully if you aren't using a cleanser. You run the risk of triggering a breakout if you don't get it all off. Whether you are trying to get rid of your acne with the help of a dermatologist or not, I highly recommend trying a cleanser purge to see how your face reacts. Even if your aren't willing to cut cleansers entirely, it is worth testing different products to figure out what cleanser type suits your skin type best. No dermatologist I've seen even hinted that a cleanser could be contributing to my acne problem. I never would have figured this out had I not tested it myself. 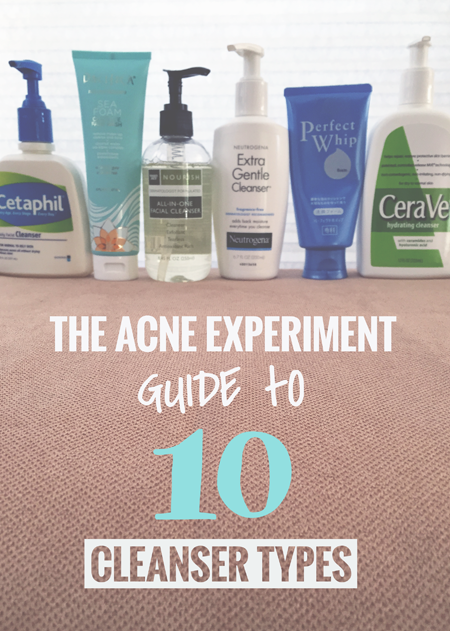 The Acne Experiment is a series I'm doing on this blog where I systematically test different "acne cures" on my face, observe results (or lack thereof), then blog about it/post really stunning before & after pictures. Lots of fun, guys. 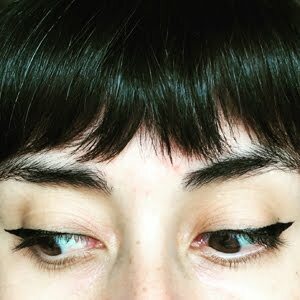 ALL Acne Experiment Posts are listed at The Acne Experiment MOTHER HUB. My daughter is 17yrs old and was just put on Retin-A...she is a senior and after really no major probs with acne she is having a bad case of it now three months before graduation...UGH! What would you recommend for face wash..I know you say to try a water cleanse but your supposed to wash off the retin-a in the morning so not sure if that would work or not. My older son ended up on Accutane five years ago as his was severe...I'm trying desperately to keep her off of that. Thanks. I use Retin-A and just rinse with water in the morning -- I always have done this in all the years I've been on Retin-A. It's mostly because I haven't found a proper cleanser that works for me. If my skin could handle it, I'd happily wash both in the morning and at night. I know that dermatologists aren't always the best at making product recommendations, but if your derm happened to give a specific recommendation, I'd try that first. If your daughter hasn't had issues with a specific cleanser in the past, she can probably just use whatever she was using before. 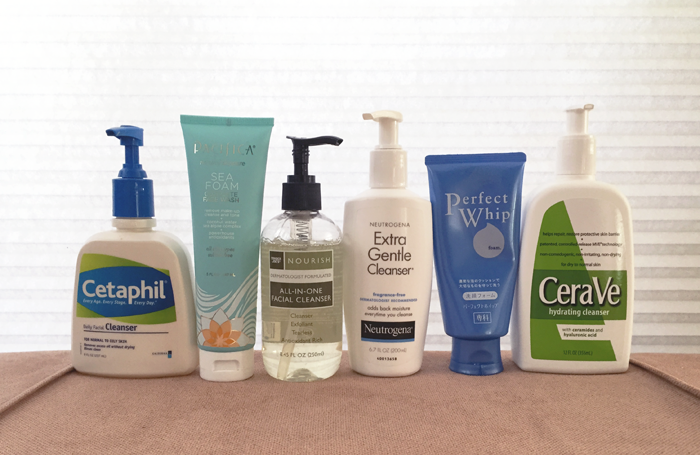 If you want to try something new, here's what I'd do: The foaming cleansers at the tippy top of the list here are the usual starting point. A lot of people use these and are fine. If foaming cleansers are too drying, switch to a non-foamer (#4). I've found micellar water to be even gentler than that, but rinse after applying. Bioderma Sensibo H20 is my favorite. My routine right now is, rinse in the morning, apply my morning medication + oil/moisturizer. I apply Retin-A at night in the dosage recommended by my dermatologist. I use Bioderma micellar water as a "cleanser" every-other night, or whenever I wear makeup (I don't wear a full face of makeup very often). I also use the Jane Iredale cleansing cloth on days I have a lot of makeup on; I use it with only water, after the micellar water.